In a recently released New York Times survey, eight out of 10 voters polled said this election is “repulsive” instead of “exciting.” For voters in New Hampshire, they say one reason they’re so repulsed, is because they feel like they can’t escape. There are signs on every corner, dozens of fliers in the mail every week, and the phone calls as soon as you sit down for dinner. “I don’t even answer the phone anymore,” said Manchester resident Neal Brown. The political messages are pouring in from every direction. 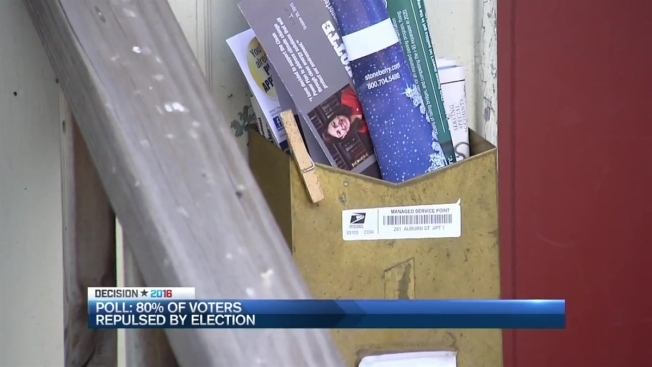 There have been nearly 80 mailers in just the last month. One necn viewer got 15 in her mailbox just this morning while another sent us a picture of her fliers in the trash. “It’s been a lot of mudslinging and pretty disgusting commentary,” said Manchester resident Brittany Hines. How Do First-Time Voters Feel About The Election? As for the recent poll that shows 80 percent of voters feel “repulsed,” many Granite Staters agree. “100 percent,” said Manchester resident Henry Pauly. New Hampshire Political Analyst Scott Spradling warns, that sentiment could be detrimental to voter turnout. “One thing we’ve learned historically from elections is that when people are voting against something there’s a higher likelihood they won’t go out and vote,” Spradling explained. But this election might buck that trend, at least, according to our non-scientific poll in Manchester on Friday. And all but one person said they plan to head to the polls on Tuesday.